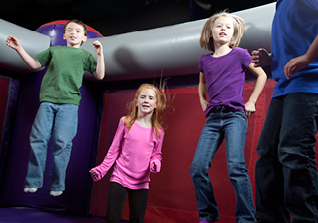 Bounce U is a wonderful place to visit and get out of the classroom! We are perfect for place to bring daycare groups, PTA youth groups, school trips, or any other group of children that just want to bounce! 90 minutes arena time is $7.95/per child and 2 hours arena time is $8.95/per child. Pizza and drinks or hot dog and drinks are available at the end of arena time for just $2.50 per person. You are also welcome to bring your own lunches and rent our party room for $25/ per 30 minutes. Please call our location for more information.